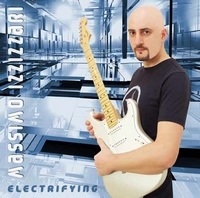 A purely instrumental album hits the shelves at the record stores from Italian guitar master Massimo Izzizzari who releases his second album since 2007. There are 9 compositions that brings an endless guitar equilibrium that are without vocals only added a mere drum sound. Beyond that it is exclusively Izzizzari who gives examples of what he can do with a guitar. The songs are very similar and almost classical in the way he writes them, but I am sure that listeners who prefer quality guitar playing in a relaxed manner will find this new album very attractive. Some might miss vocals on the songs, but it is a question of what kind of music you like. This album is of 9 songs with guitar playing done by a master.